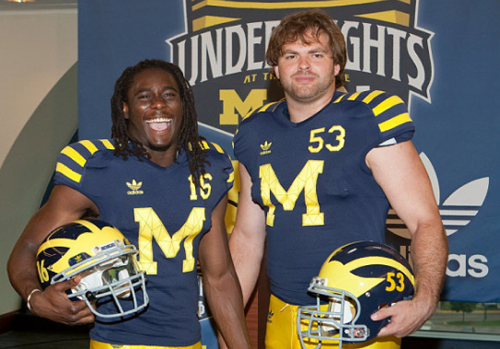 When images of Michigan's "throwback" jerseys first leaked, I was kind of horrified. Then, as I took a little more time to look at them, they didn't seem quite so bad. They were blue, the same color blue that Michigan always wears. They had a big maize Block M in the middle, the likes of which Michigan has worn before. There were stripey things on the shoulders that players used to wear in the 1800s (albeit not in games). And there are numbers on the helmets, which Michigan has worn before. All-in-all, when taken as a whole, the jerseys themselves were pretty unobjectionable. Now that we've seen players modeling the jerseys, they still look alright and, more importantly, they still look like Michigan, albeit kind of a wonky Michigan. But that's not what's bothering people. It seems like everyone is terrified that stripey shoulders equals corporate takeover doom, but frankly, I don't see it. One of these is an honest attempt at creating a throwback jersey. The other is a new line of Ed Hardy clothes. Michigan took the high road. If we live in a world in which college football is in the business of making money and not a contest of athletes led by Horace Prettyman, exhibiting their virtue and hard work, then throwback jerseys and night games, which, by the way, breaks the hallowed Michigan tradition as well but no one seems to care because it gives the school exposure and prime time TV revenue, are part of the game. At least we have an athletic department and sponsor that's made a concerted effort not to piss on all of Michigan's traditions. The stripes on the shoulders are there for a reason. Whether or not the team has ever worn them in a game, there is historical evidence that something approximating those stripes is part of Michigan's tradition. 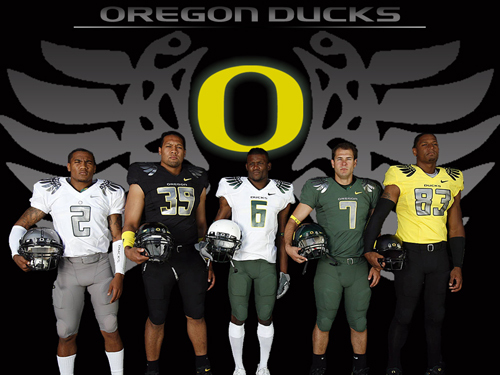 Same goes for the numbers on the helmets and the Block M on the front. Yes, the school hopes to make a buck off of these jerseys, and that's fine. It's the nature of the business. But there are real, logical allusions in all of these features because Dave Brandon gets Michigan tradition. Say what you will about the coaching search (and Lord knows I disagree with it), but Brandon legitimately cares about the school's tradition and you can see that tradition was a major component in the design of these jerseys. Honestly, what's worse: Creating new "throwback" jerseys that openly cop to moments in the program's history or making very slight cosmetic changes to the existing jersey and telling the fans they're too stupid to tell the difference and should buy it anyway? College football is a money business and this is one of the most common tactics. We should be thankful that we have an AD in place that isn't willing to let Adidas go all Nike on Michigan's jerseys and have the team run out in a bunch of Maize pajamas. Is this going to turn into a recurring thing? Is Michigan going to wear these jerseys or, gasp, other throwback jerseys in subsequent years? Maybe, I don't know really. But these jerseys aren't totally objectionable and the administration has already shown that they're unwilling to totally break from tradition when designing something new. So what other avenues will Adidas be able to explore? And maybe that's the fear. If this is successful enough, the administration will start pushing for new jerseys every year and Michigan will end up with the rest of the churn, wearing things that resemble a Lady Gaga red carpet ensemble. But for me, I just don't see it. These jerseys openly address Michigan's traditions but are different enough to be something the school can profit from. Until we start seeing wolverine claws on the gloves or shoulders, I won't be too worried.